I just released Conduit 0.3.7. This was another regular release which contains the usual array of bug fixes and a few small new features and tidy ups. This was also the first release made automatically using maintainer. Aside from a few quirks, the tool worked amazingly well. Update to use the newer Tomboy Set/GetNoteComplete API. This finally allows lossless sync of Tomboy notes including metadata such as tags and notebooks. Add a 'developer' sub-menu to the help menu if the user is running a development version. 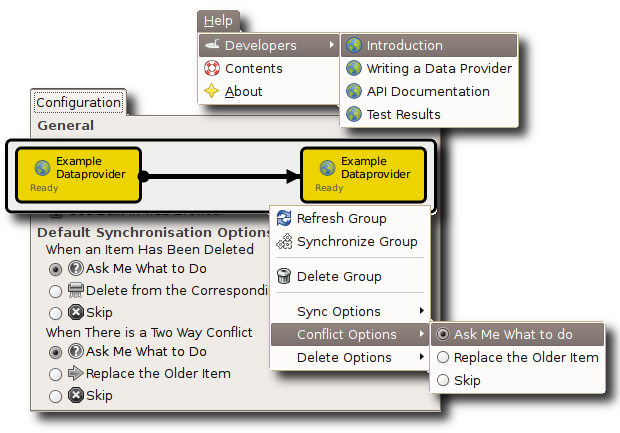 This sub-menu contains items which link to the newly improved developer documentation. The linked pages are displayed in conduit's built in web browser. Update: I completely forgot. Thomas Van Machelen recently added C# bindings for our DBus API to SVN. If any of you enterprising Novell Hack Week hackers wants to play with them, I have some ideas (use Conduit to export photos from FSpot, use Conduit as the sync engine for Tomboy, for both synchronization of notes between two computers and/or export to ipod, box.net, etc). Please email me if you are interested. I know Conduit is ready, there are many examples of the Conduit DBus API in SVN.